Situated among the clouds in the highest reaches of Drangleic. 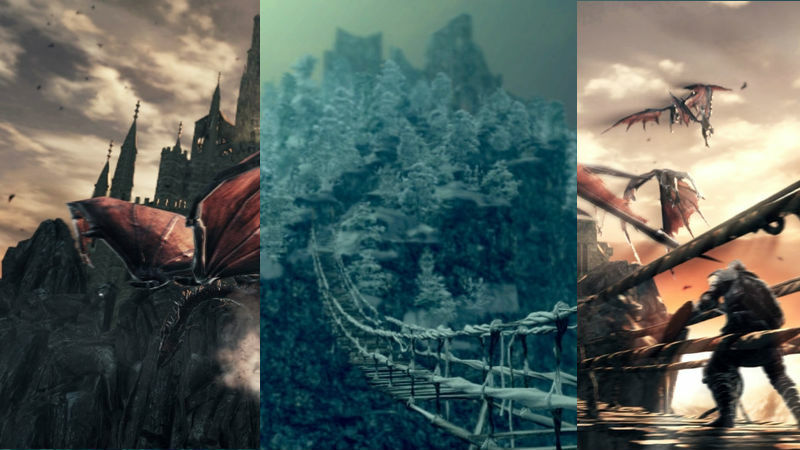 The surrounding spires of rock are a nesting ground for wyverns and dragons. A series of precarious rope bridges leads the way to the Dragon Shrine. Try not to break too many eggs, as that will anger a Guardian Dragon who will swoop down to knock you off the final bridge. The area is only accessible by an elevator behind Aldia's Keep. Undead Citizen (Yellow Core): An unfortunate victim of the experiments conducted in Aldia. Sustained by yet another variation of the sources of artificial life developed by the Dragon Acolytes. Wyvern: A small dragon with a barbed tail. Guardian Dragon: A dragon that most likely began as an unwilling participant in the experiments conducted at the Manor. The pillars are Archtrees from Ash Lake. They are farmed arch trees. They were used to create the bodies of the golems. The pillars appear to be stone. This may be because the archtrees petrified over time (Petrified Egg). It fits so well, that it begs the question: is the Aerie the same location as the Painted World, but in a different time? One piece of evidence is that Crossbreed Priscilla, a dragon of sorts, lived in the Painted World. Return to last bonfire rested at. possibilities from the mere sight of a feather. A giant dragon tooth used as a great hammer. of this claim is unclear.